Once a busy warehouse area, Bricktown is Oklahoma City's hottest entertainment and dining district. With dozens of restaurants, shopping, Chickasaw Bricktown Ballpark, Harkins Theatre and a generous helping of turn-of-the-century charm, Bricktown offers visitors a variety of activities in downtown Oklahoma City. Located just one block from the Chesapeake Energy Arena, Bricktown is the place to be before and after Oklahoma City Thunder games! 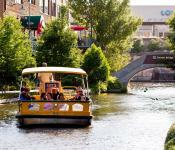 Enjoy a stroll along the mile-long Bricktown Canal, take a cruise on a Bricktown Water Taxi or enjoy some tunes at the American Banjo Museum.